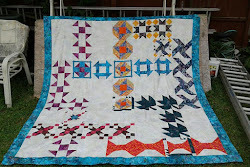 Jean's Quilting Page: Do you like a good quilty challenge? 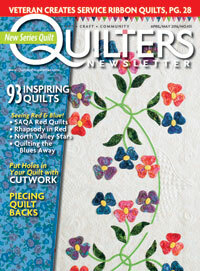 Do you like a good quilty challenge? 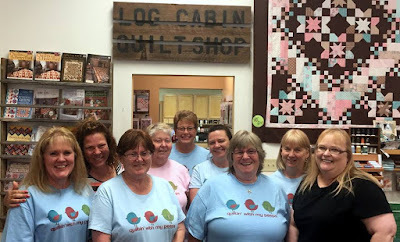 My quilting retreat is coming up next month, so I thought I should work on our "challenge". We play several different games during the retreat, playing for fat quarters and another specified size of fabric (2.5" sq, 5" sq, 2.5" x 6.5" rect. 2.5" strips to name a few). That second piece of fabric changes from time to time and has a catch....we have to make something out of our winnings before the next retreat. Last time, we played with 10" sq. I ended up with 22 of them. That's actually enough to make a quilt, but I decided to make some smaller projects instead. My first project was a Boxy Corner Pouch. I like this cute, Craftsy pattern. It's easy to adjust and make larger or smaller sizes too. So perfect for this one. I took 4 of the 10" sq. and made a 4-patch. Then I cut several strips from the sides, moving them to the opposite sides of the center 4 -patch for an interesting, patchy look. It was fun playing around with it like that! Next I quilted it using a cute stripe for the inside and a simple line design, not worrying if the lines were completely straight and perfect. It's a little longer than some of the others I made, but I just went with the size it turned out after cutting, sewing together, and quilting. I like it and they make great gifts if I end up with too many! Now what should I make with the other 18 sq. We decided to exchange 3" sq. at our next retreat. I re-covered my tabletop ironing board before the family sew-in last week. It was burnt up and ugly, so I found this cute cat fabric to brighten it up. I know it will get burnt up too, but since I bought it a long time ago and haven't used it, I figured I could enjoy it while it does last. Do you make or buy covers for your board? I spent some time tonight prepping for Saturday's Super Tote class. I think I'm ready! I love that boxy pouch. Great job. Like you....I need to cover my ironing space. Mine is so gross. Your bag is really cute! 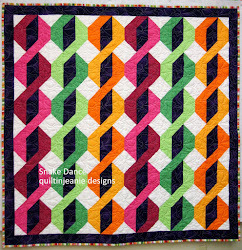 And what a clever way to jazz up your 10 in squares! Thanks for the link to the pattern. I like your groups games ideas. I'll have to tell my guild retreat people! We're always looking for ideas. I like the boxy much. I'm afraid I buy my ironing board covers as they are so inexpensive. I keep thinking I should make my ironing board covers and then I end up buying them as I don't want to to spend the time. Love your boxy pouch! You could use up all kinds of orphan blocks that way, too. Love how you think! I just covered the new ironing board hubby cut for me (18"x60", attached to a standard ironing board). I covered mine in non-stick, quilted fabric from Joann's. I've always liked the non-stick (silver teflon) ironing board covers. They last much longer than plain cotton covers. Cute bag. Another fun family sewing day! Who's ready for some new projects? Craftsy SALE!